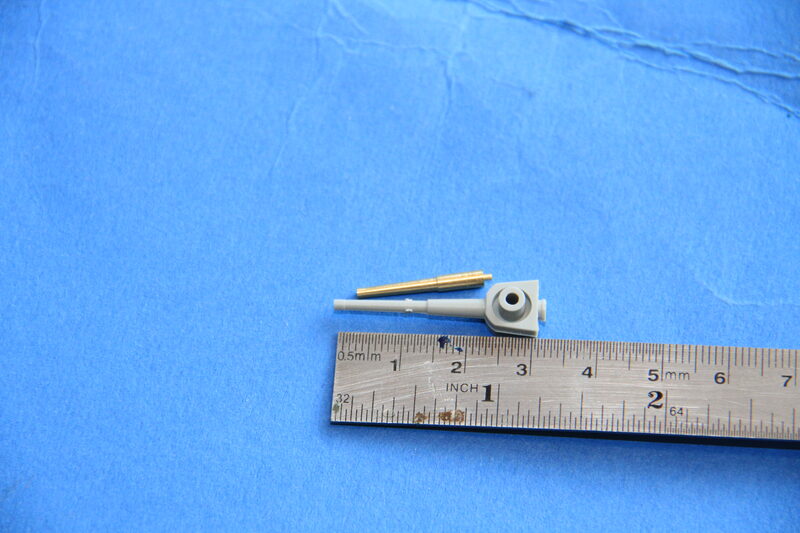 KitMaker Network :: Mikasa 1902 with Pontos 1/200th. I've been a bit of a lurker lately - modeling mojo gone a little flat but it always returns . I have been following your builds for a bit now and want to compliment you on your workmanship and I , like many , am amazed at your prolific output. Keep it up - fuel for inspiration. Thank you for your kind comments, I am glad you are enjoying what I am doing. I am a little more prolific than usual as currently I am working from home and that gives me an hour or two most evenings to sneak into the workshop and do a bit. Glad to have you looking in, and please feel free to comment any time you like. It'll be interesting seeing your plan come to fruition. The old ship was quite stout, eh? Quite a pronounced ram bow, too. So will I, it is a bit organic. Like almost all aftermarket sets, the order of the kit and the Pontos instructions bear no relationship to each other, and neither of them bear any relationship to the order I do things in. The pre-dreadnoughts were sturdy beasts for there size, and with those big guns on such a small hull made them look tough. I like the elegance of the ram bow, even though they were totally impractical at the time of this fine vessel. Very nice start, and of course I'm in and following! Looking forward to one more special build of yours, mate! I've been wanting to build Borodino or one of the other Russian pre-dreadnoughts. Finding one in 200 scale would be awesome. ...Quite a pronounced ram bow, too. I wonder if the ram-like inverted bows of Mikasa and other ships this era were actually intended to serve as rams or were they predecessors of the later bulbous underwater bows intended to increase buoyancy and reduce water resistance? Tim, I believe the ram like bows were still part of Admiralty belief that ramming was an acceptable tactic. Always glad to have you aboard mate. This is my first step into this scale, in theory this should be a little simpler than the WW2 era battlewagons. We shall have to see how it goes. Unfortunately Gaz, Mikasa, albeit in two forms is the only game in town in this scale. 1/350th there are a fair few Russian pre-dreads both plastic & resin. any other pre-dread in 1/200th would be fine by me. The Ram came back into fashion in the early Ironclads, which had few if any, guns capable of penetrating their opponent's armour and they had an appalling rate of fire. Ramming was used with varying success at The Battles of Hampton Roads, Lissa & Iquque in the third quarter of the 19th centaury. It's effectiveness was proved by the accidental ramming of the HMS Victoria by HMS Camperdown in 1893. 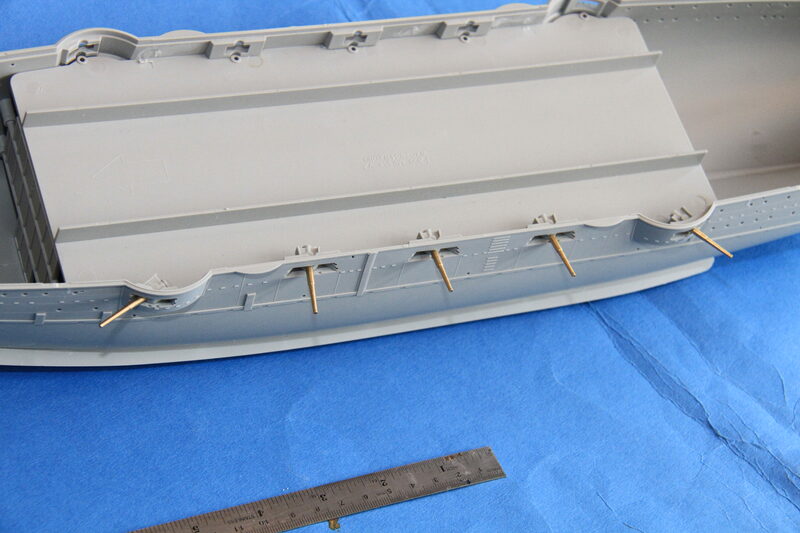 The ram was going out of fashion around the time the Mikasa was built, so this could be the "inverted bow" which was the precursor of the bulbous bow. The idea was to maintain the waterline length (the power needed to push a ship the water at any given speed is a function of speed / square root of the length on the waterline,) whilst having less deck exposed to the muzzle flash of the more powerful guns. From the shape of this, I reckon it was designed to be used as a ram if the opportunity presented itself, whilst serving as an inverted bow. A ram wouldn't be a bad idea those ships, they do look a bit like a tall narrow version of a casemate ironclad from the 1860s / 70s. The seam filled and almost leaned up, not really that bad. 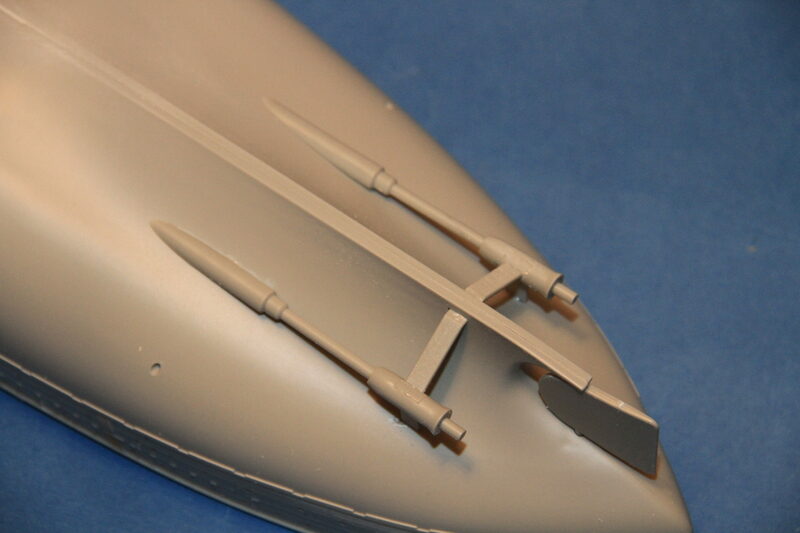 Propeller shafts fitted in place. 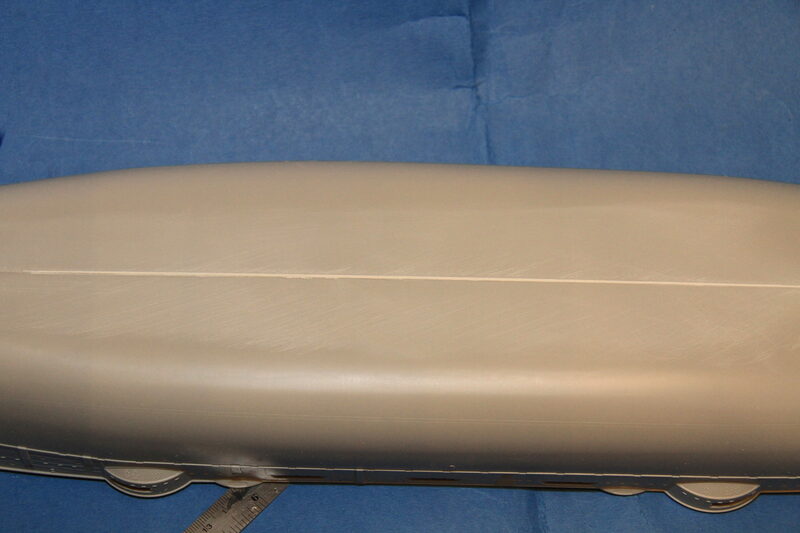 The seam cleaned up and the bilge keels fitted. The kit 6" with the Pontos barrel for comparison, the actual barrel length should be 6.050 mtrs, which translated to just over 30mm, which makes the kit barrel overlong. fitted, again with an original for comparison. 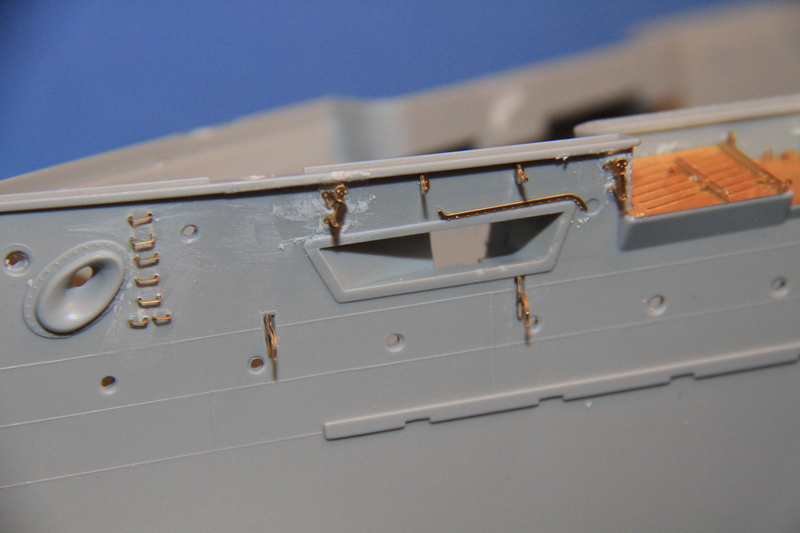 Port guns fitted, but not glued. 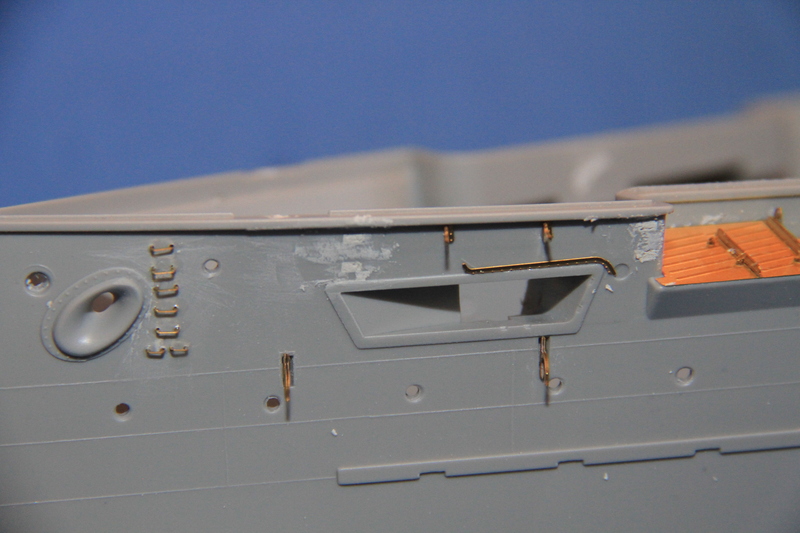 And the gunports fitted in the closed position. 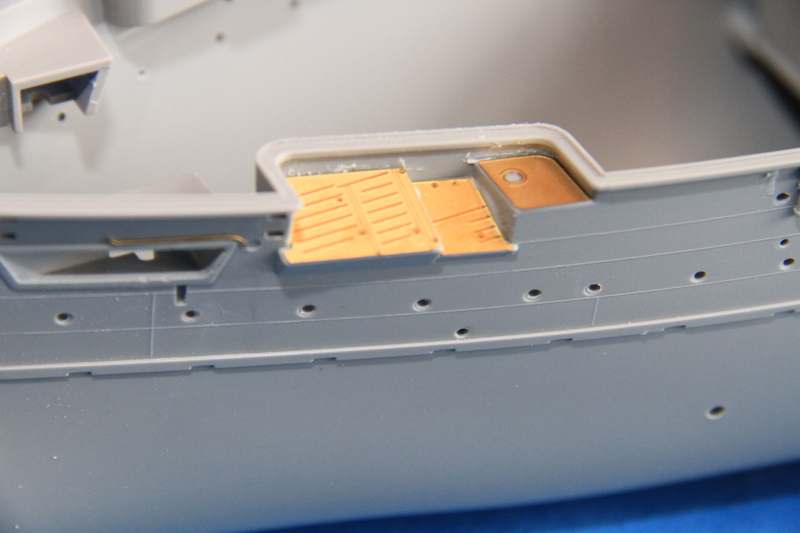 I have used the kit ports, as the Pontos ports have the actual barrel port for the barrel in the closed position on the three centre guns. 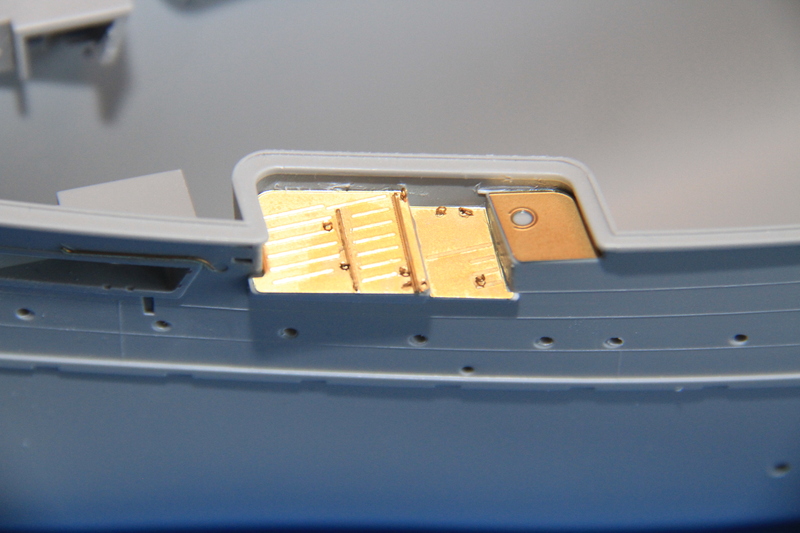 One slight issue, the hinge points on centre section of each port do not line up with their mounting slots, not a major issue, just a little error. 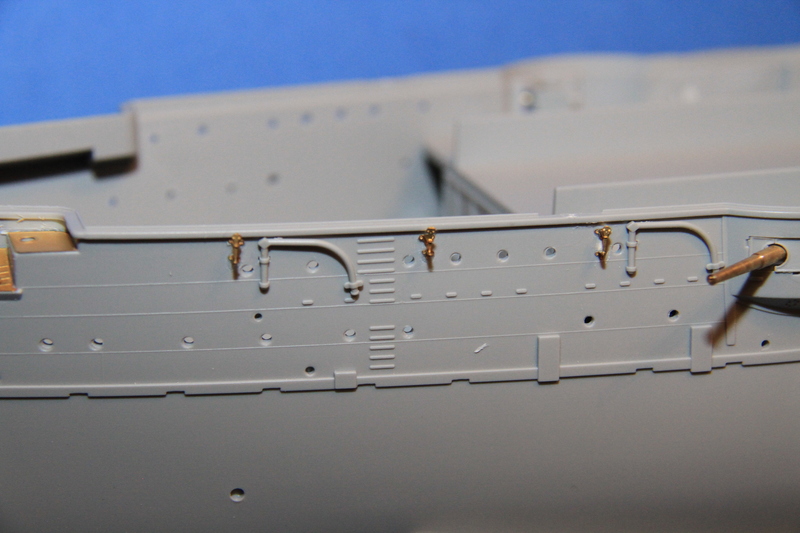 the starboard guns in place. 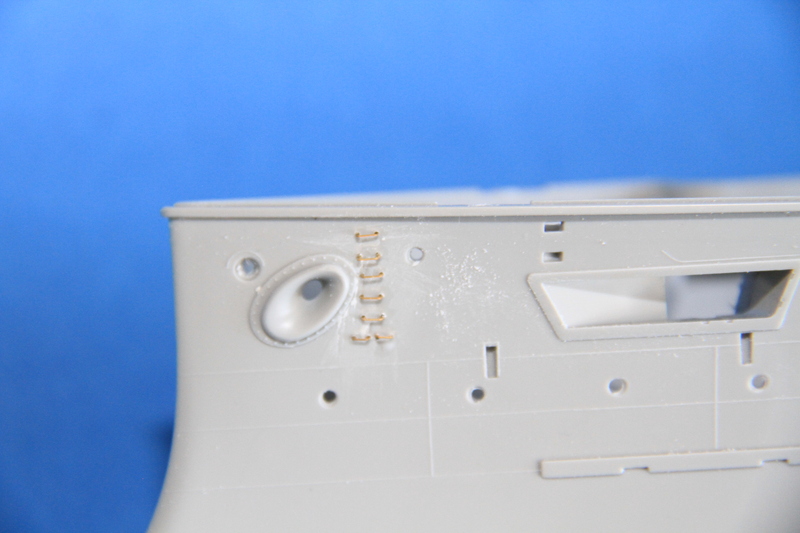 The starboard ports will be open, and fitted much later in the build. Those turned brass guns are a big improvement! 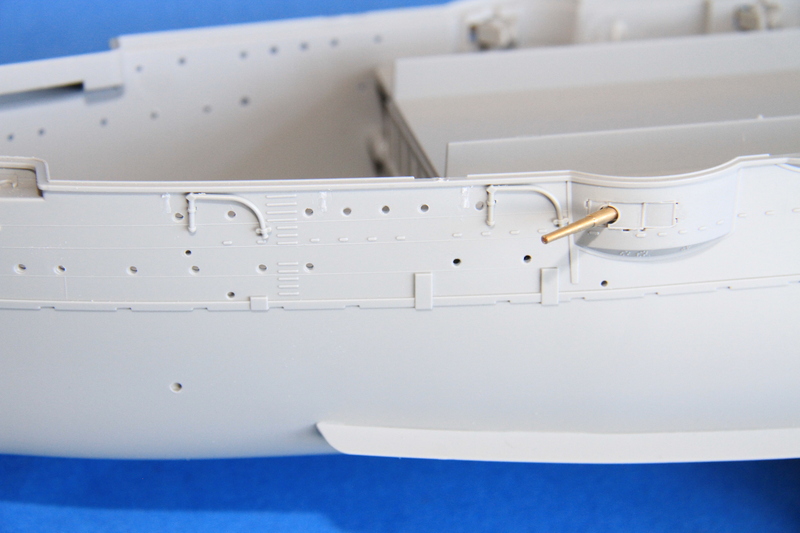 And that's a cool idea with the half open/half closed secondary guns - gives observers a reward for looking at both sides of the finished model. Removed by original poster on 12/18/18 - 17:20:01 (GMT). 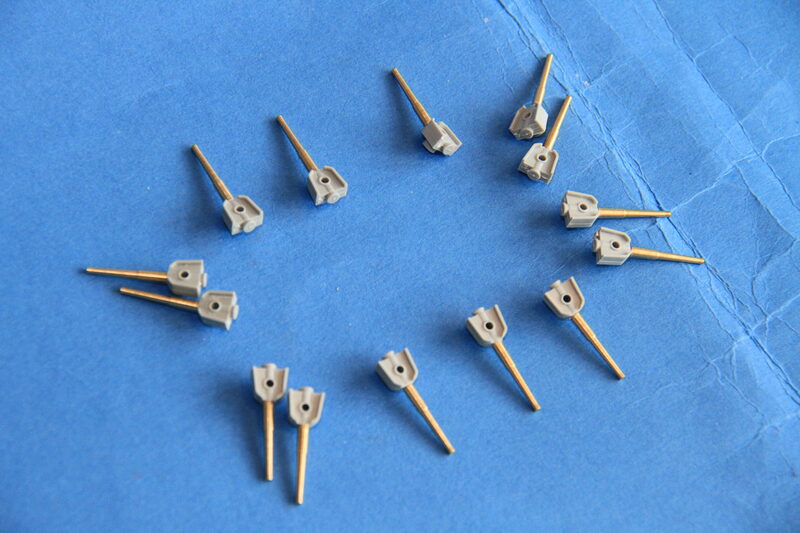 They certainly are Tim, I would have hated to have to correct & re-drill all 14 kit barrels. I did like the option have the ports open or closed, seemed a waste not to exercise both options, and as you say it adds some interest. Thank-you for looking in and your kind comments. Yes, those brass barrels really do make a difference. Looking sweet Si. 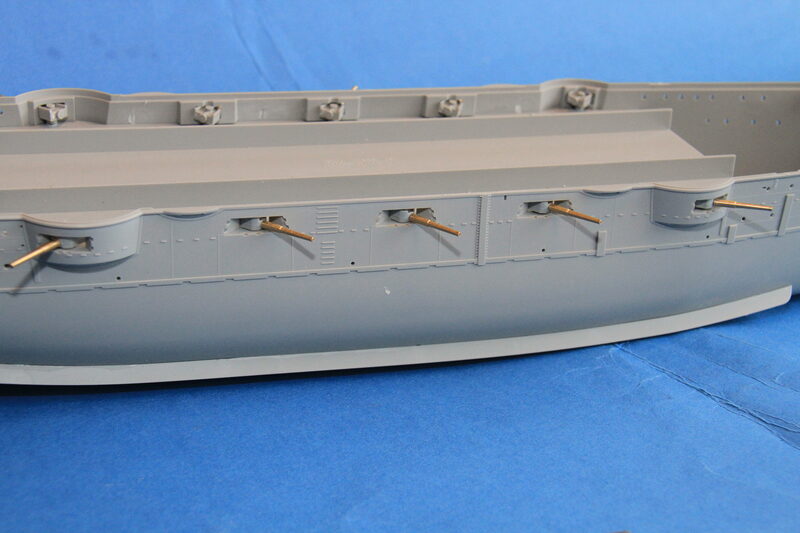 So far so good, apart from the slight hull seam, she is going together very well. Come on Master Model! We need the 9.2"s for the Lord Nelson Class! They do, for kit barrels, what is supplied isn't too bad... Until you put it against a decent bit of brass, then it looks a bit second division (as well as being too long). 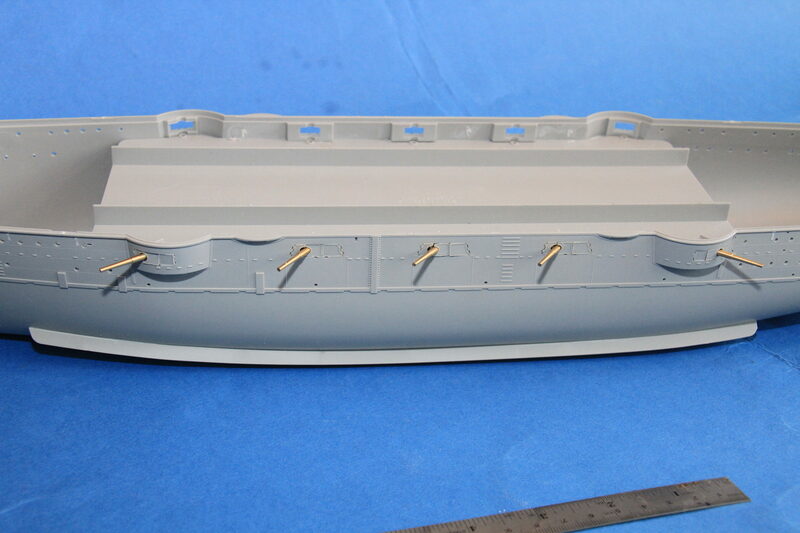 Pictures without words, except kit parts and brass going on the port bow. 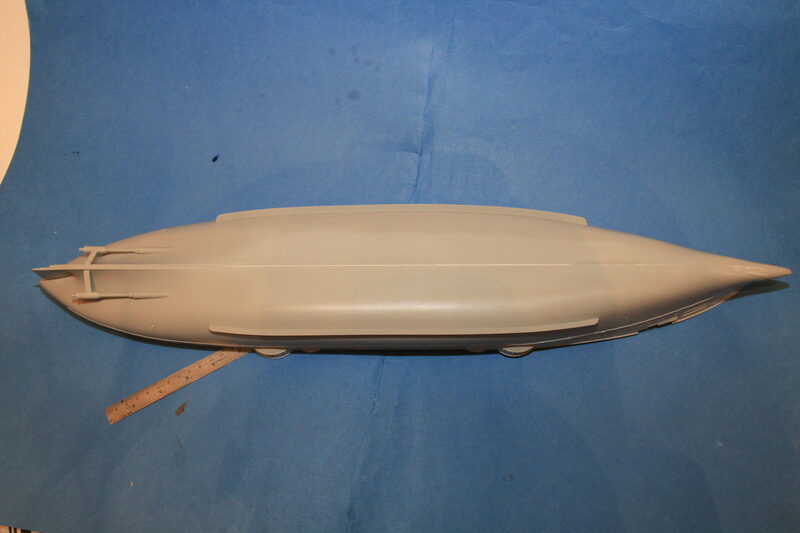 The brass parts are either replacements for moulded detail that was removed, or kit parts. that's one quarter of it done. Nicely added, Si! Bigger scale require more bling! 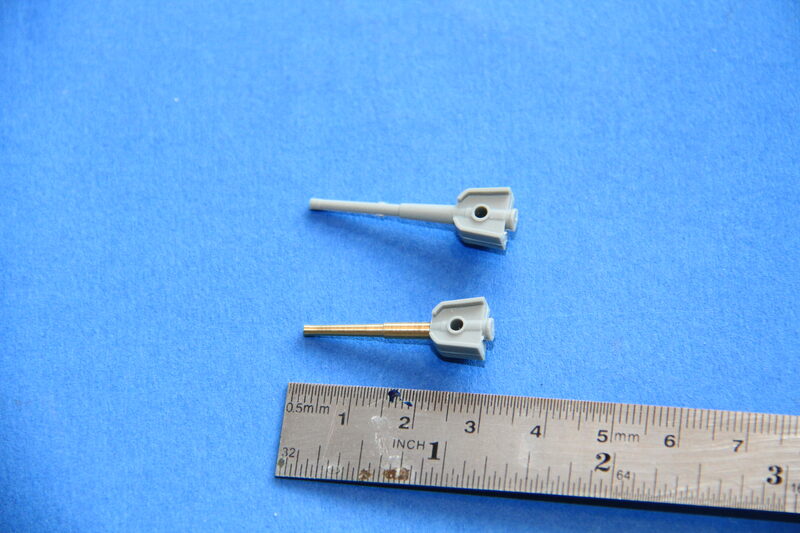 You are not wrong, and at least some of the etched parts are larger too! A great assistance to my tired old eyes. I have this kit, mainly out of nostalgia as is was built in my home town and Mikasa Street runs perpendicular to my childhood home. I've never built up the courage to start this build but your build will give me an excellent point of reference. That is an interesting connection with the ship. The kit itself looks very good, and so far goes together pretty well. Please feel free to ask anything along the way. Thanks you for looking in.